Pop. 10,326Greencastle was founded in 1821 by Scots-Irish settlers from Pennsylvania. The city became the county seat of Putman County in west-central Indiana. The city remains fairly small, with a population of around 10,300, but is expected to grow with the new city revitalization efforts taking place. Depauw University and Ivy Tech Community College make it a strong educational center and bring many visitors to the area. 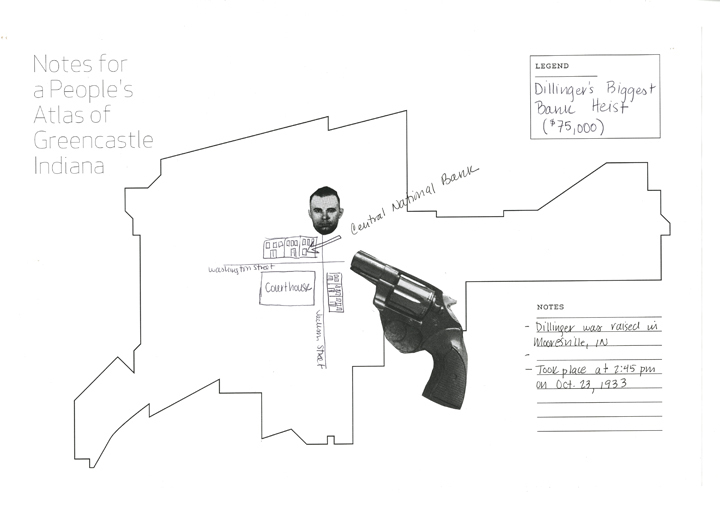 Notes: Students were assigned the task of collecting maps off campus, as a response to the intense divide between “town and gown” or Greencastle and DePaw. Lauren Cumbia, Dave Pabellon and Daniel Tucker led a workshop for the course discussing case studies of other mapping projects.